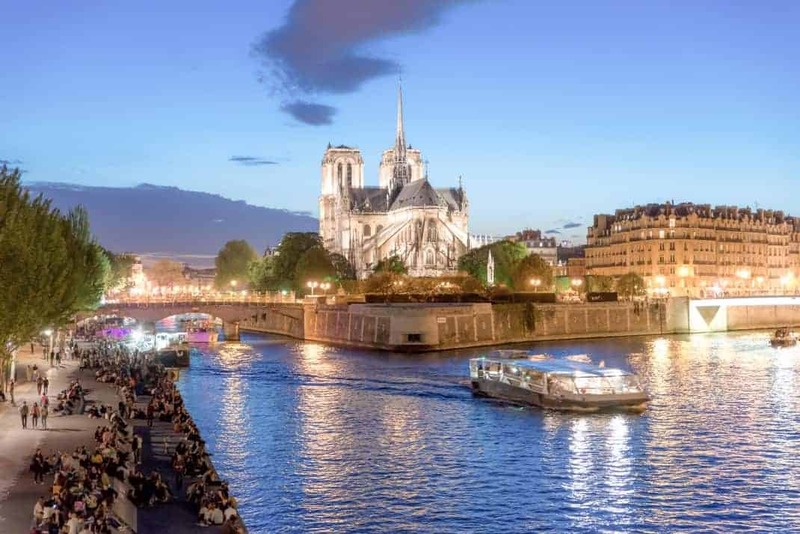 If you’re interested in experiencing more of what goes on at night when you visit Paris, then simply check out our 2019 INSIDR Paris Night Guide! Paris is just as (if not more!) magical by night as it is by day. Our team has taken it upon ourselves to compile the top 5 things to do at night in Paris, all accessible in this guide right here! Whether you’re looking for a casual stroll around the city under bright lights or a night out on the town, look no further! For the top 5 things to do in Paris during the day, read our article: Top 5 things to do in Paris. The city of lights is full of stunning architecture and monuments that truly shine when the sun goes down. One of the best places to walk in Paris to take in the city lights is down the banks of the Seine, especially across some of the most beautiful bridges in Paris. If you don’t fancy walking, consider taking a river cruise down the Seine in the evening to see all of the lights in Paris from a boat! Below are our guides to the Most Beautiful Bridges in Paris and River and Canal Cruises in Paris- two great spots that will allow you to see the sparkling city of Paris at night. Best things to do in Paris at night #1: DISCOVER SOME OF THE MOST BEAUTIFUL SPOTS IN PARIS AT NIGHT! Compared to many countries, dinner is served a bit later in France, around 8:30 or 9pm. If you want to live like a local on your next vacation in Paris, head to a café and enjoy an apéritif before a late dinner seating. Check out our favorite spots below, some of the best spots where locals eat in Paris! Whether you’re a wine drinker or like to try new experimental cocktails, Paris’ bars are full of life at night. Some of the best cocktail bars are hidden from the mainstream tourists, but not to worry! Our guide tells you exactly where these bars are and how you should find them. Alternatively, wine drinkers can enjoy a tasting of some of the finest French wines at wine bars in our article ‘Where to go wine tasting in Paris‘. Get ready to sample sophisticated cocktails or channel your inner sommelier on your next trip to Paris at some of the best places to sip on cocktails at night in Paris. SELECT YOUR DRINK OF CHOICE AND GET READY FOR DRINKS OUT! Consider ending your evening after walking the banks of the Seine at night with a full-stomach in a bar to enjoy some live music! Live music venues in Paris are often smaller venues that can be romantic, so should you be looking for a great date spot in Paris at night consider one of our favorite live music bars for a dreamy Parisian date with classic music. Are you feeling adventurous and daring enough to explore underground Paris? Our guide below tells you everything you need to know about this secret social setting that you should take full advantage of during a night out in Paris!